This cake has become a family favorite! It always turns out perfectly! 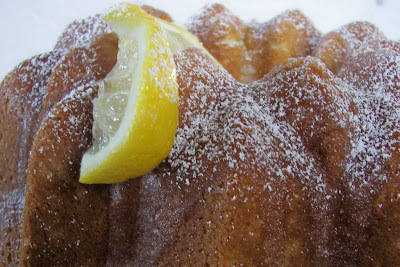 I love the texture that the cornmeal gives the cake and OF COURSE I love the lemon flavor...especially the lemon glaze. This cake is made with a normal-sized Bundt pan, but my daughter Tati has made this recipe with the mini-sized Bundt pans HERE. This recipe is from a March 2009 Women's Day Magazine. Heat oven to 325 degrees. Coat a 10-cup decorative tube pan or 12-cup Bundt pan with baking spray. In medium bowl, whisk together flour, cornmeal, baking powder and soda, and salt. Set aside. In a large bowl, beat butter, sugar, lemon zest and juice with mixer on medium speed until light and fluffy. Beat in the eggs one at a time until blended. With mixer on low, alternately beat in flour mixture and buttermilk until batter is smooth. Scrape into prepared pan; level top with spatula. Bake approximately 45-50 minutes until a wooden pick inserted in cakes comes out clean. Do NOT overbake!!! Check frequently as you near the end of baking. Cool cake in pan on wire rack for 5 minutes. Then add the glaze. 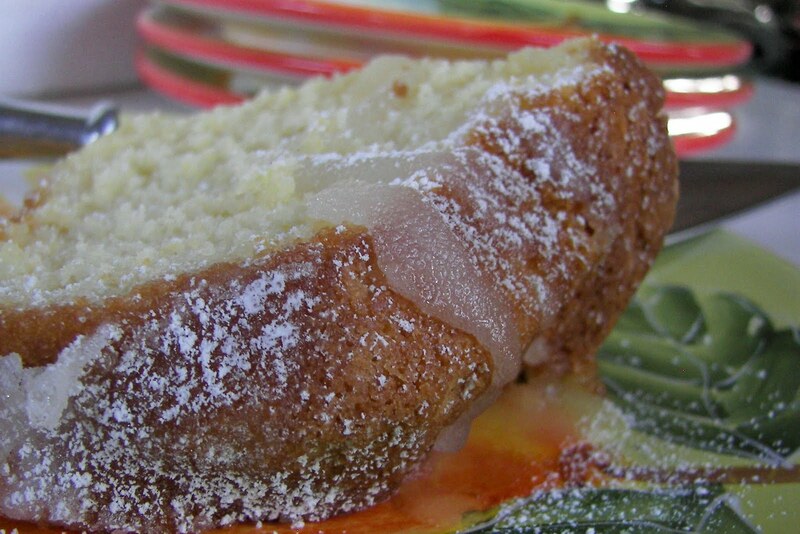 See instructions for inverting cake and making and adding glaze. Whisk glaze ingredients in a small bowl just until combined (sugar will not be totally dissolved). Invert cake from pan onto rack; place rack over a baking sheet. Brush glaze all over hot cake until absorbed (sugar crystals will be evident). Cool completely. Transfer cake to a serving plate and cover. Let cake rest several hours or overnight before serving. Store cake covered at room temperature up to 4 days. Note: Make the glaze while the cake is baking. 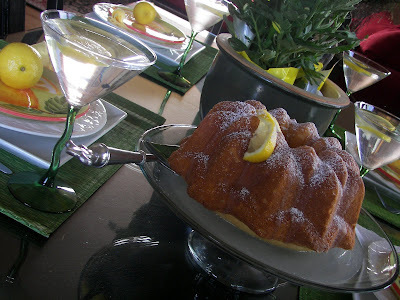 I am posting at Foodie Friday where Michael Lee West reigns as hostess. Joni, that cakes looks and sounds delicious...I will be trying it out this weekend! Wow....I have to bring a cake to a faculty function next week and this looks like the recipe to try. It sounds delicious!!! I hope it isn't hard to make that glaze. I am not the best cook in the world. That looks so good! I love lemon in the summer. I am a lemon-lover, and I am definitely saving this. Love lemon, love buttermilk, love cornmeal... sounds wonderful! What's not to love? What a wonderful recipe for summer! I can't wait to try it. It looks delicious! Lots of my favorite things here - and The Great Dane LOVES lemon. This looks like a good reward for whatever work we do on Saturday. I've waited all day for this and it looks like it was worth the wait! I am making it for Sunday to serve with fresh blueberries. Thanks Joni! This looks wonderful. I am definitely going to make this when we get back up north. 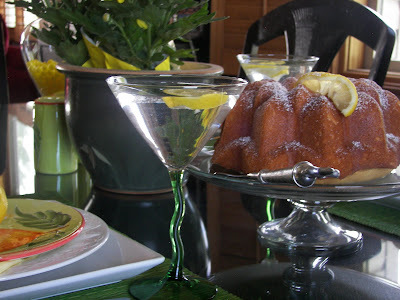 I even have that bundt pan! This recipe has got me pondering what it would taste like---sweet cornbread with a taste of lemon?? I don't take WD magazine. I just happened to get the one with the bees on it. Maybe I should start getting it! The cake is beautiful! Joni, thanks for the recipe. I'm going to make this. I like pastries made with corn meal. It provides an interesting texture. Looks beautiful too! What a delicious looking combination of flavors. I bet a slice would be wonderful with some fresh strawberries. Oh my word...you always post the most divine recipes. I actually just bought some lemons today but I don't have cornmeal. I will try to get some and make this. Hope your weekend is wonderful Joni.